Description: Acidic gravel and sand beds (more permeable) i.e. the ‘Stanmore Gravels ; are interleaved with beds of clay (more impermeable). in a suburban grass/woodland nature reserve at about 130 m altitude ( map at ref 1 below). 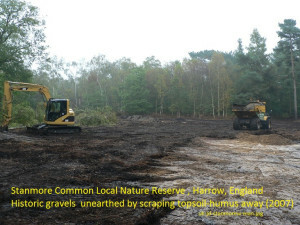 Stanmore Gravels have been ‘buried’ by compost over the years and recently exposed in two ‘scrapes’: The west scrape dates from 2007, also called ‘New Heath’ (compartment 21); The east scrape from 2013, overlaps with part of Bluebell Heath West (compartment 20a) and Flushing Wood (compartment 2). Stanmore Common Local Nature Reserve, Harrow, is a part of Greater London, adjacent to the Hertfordshire border. – Historical – The Common is littered with small pits where historically gravel extraction was carried out manually as a local cottage industry. – Botanical – Stanmore Common has been well recorded botanically since at least the 19th century. – Biodiversity – Historic heathland/acid grassland habitats occur as a mosaic of bare soil, grassland/tussock, heather (Calluna vulgaris) and scrub. As the seeded heather grew on the west scrape, a number of other unexpected and uncommon plants appeared from the historic seed bank in the soil: mainly grasses, sedges, rushes and ferns. Many of these were species new to the Common or long-unrecorded there. 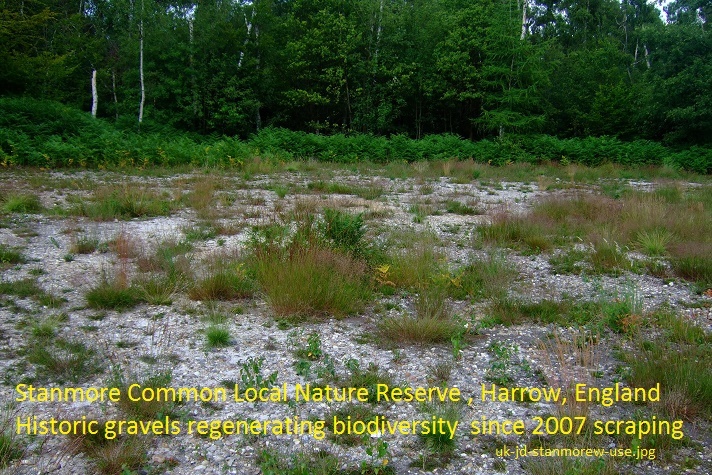 The east scrape has been left to regenerate without introduced heather, and is giving rise to a similar mix of historic flora (Detailed list* and link below). – Soil is a Seed bank – The soil seed bank is the accumulation of viable but un-germinated seeds within the soil. At Stanmore Common, removal of the (high fertility) topsoil has exposed the (low fertility) underlying gravel beds enabling the historic flora native to that soil type to re-emerge. Seeds of some species persist for many decades or even longer. 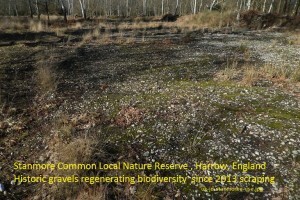 – Funding for such restoration work – as part of a Heritage Lottery Fund/Harrow Council sponsored project run by Harrow Nature Conservation Forum. 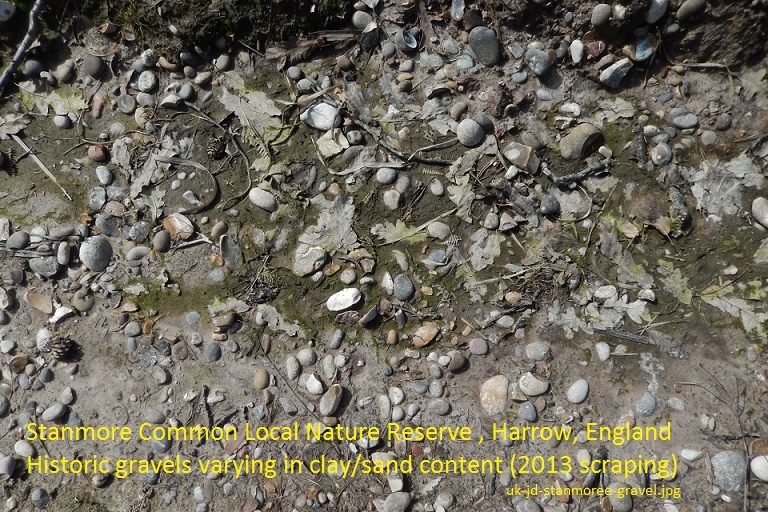 – Unearthing historic soils – create ‘scrapes’, i.e. clear the scrub and remove the topsoil (superficial clay and humus) that has built up over over the decades. – Knowledge of a ‘lost’ habitat – record and monitor, what grows (e.g. previously unrecorded flora such as brown bent (Agrostis vinealis) ) and other regional rarities such as green-ribbed sedge (Carex binervis). – Monitoring – Volunteers were trained to recognise the ‘high value’ plant species on the scrapes, and these are monitored annually. –Weed management where weedy species and scrub emerge – they are removed by hand during the work-parties the voluntary Warden, Simon Braidman runs at the Common. Humus build-up is not yet an issue, but may have to be addressed in the future. – Adaptive learning of what/if to plant –The first (west) scrape had plantings of (clean) heather seeds to aid the return of heather habitat. These seeds were obtained from a local source – Hounslow Heath, also in London – and scattered over the site by children from local schools. In the light of experience gained from the west scrape (in photo top right ), the second east scrape had no introduced species allowing this soil’s high quality emergent botany to be revealed ( in photo bottom left ). and, out of shot and growing in the ‘wrong’ habitat, Hard fern (Blechnum spicant). and Birch seedlings – expected to be a mix of the very common Silver birch (Betula pendula) and the Silver birch/downy birch hybrid (Betula x aurata). 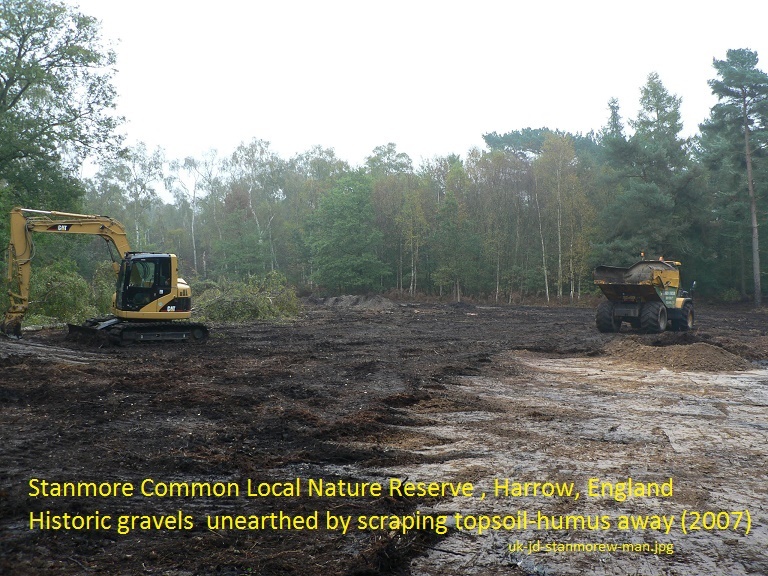 1 the local area of the Stanmore Common, open this pdf map Stanmore_Common_Master_Map_Scrapes_JRD_April2015. 3 The biodiversity of the Stanmore Common in a botanical survey conducted by John Dobson in 2010, go to http://www.harrowncf.org/HNCF_documents.html and click to download “a detailed botanical survey of Stanmore Common” (pdf). 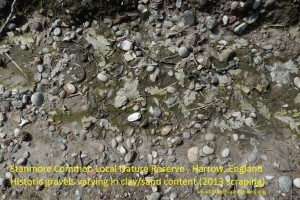 4 Some records of the invertebrates of the Common as well as records from other reserves in Harrow can be found at: http://www.harrowncf.org/HNCF_documents.html and click to download Species Lists as Excel or pdf files. 5. For another Soil Selfies looking at growing historic plants of soils, and monitoring and recording species and habitat in a different way, see Koute a Tyon, in the Savoie and the link to its family farm snapshot . Credits: John Dobson, of Harrow, gives permission for these photos and information to be used under a (cc) license 2015.